The Sacred Lake Fish. | Dreams are the poetic expression of the soul. Provenance: The Pollock Gallery, Toronto. 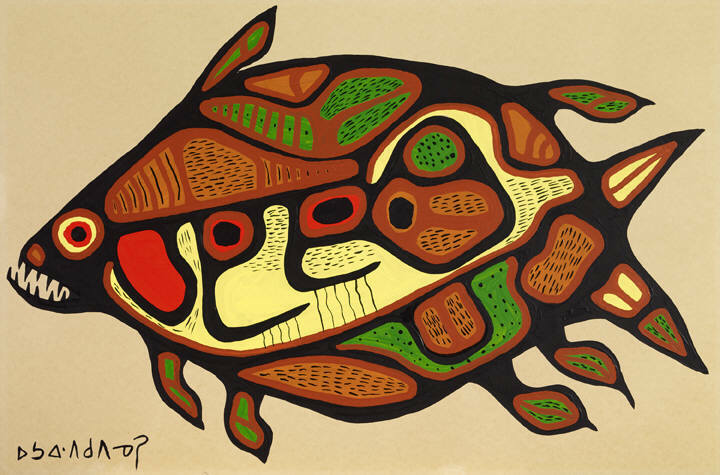 In preparation of this year’s retrospective at the Kinsman-Robinson Gallery, I share one of my favourite Norval Morrisseau paintings. This entry was posted in 20th Century Art, 20th century Canadian art, 20th century Canadian artists, Acrylic paintings, Amerindian Art, Animals, Art, Art Collecting, Art Exhibition, Artists, Award-winning artist, Canadian art, Canadian artists, Contemporary art, Contemporary Canadian art, Contemporary Canadian Artists, Creative Genius, First Nations Art, First Nations Artists, Michael Overleaves, Michael Teachings, Ojibwe art, Painters, Painting, Shamanism, Visionaries and tagged Canadian artists, Canadian creative geniuses, First Nation artists, Kinsman Robinson Gallery, Members of the Order of Canada, Members of the Royal Canadian Academy of Arts, Michael Overleaves, Michael students, Michael Teachings, Norval Morriesseau, Ojibwe, Ojibwe artists, Old soul artisans, Old soul artists, Old soul Canadian artists, Old souls, Ontario-born artists, Toronto Art Galleries, Yorkville galleries. Bookmark the permalink.